Buy a t-shirt and support Return and Liberation: Conference of the Palestinian Shatat in North America! 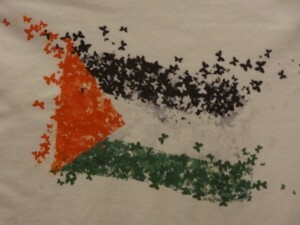 These unisex t-shirts are white, feature a Palestinian flag/butterfly design (to the right) and are available for $15. All proceeds will support conference organizing and supporting people to participate at the conference. Support the conference with a great t-shirt to show your support for Palestine!